SAINT AUGUSTINE – – The St. Augustine Humane Society will applaud the 2018 Pin Up Paws pet calendar contest winners and debut the pictorial 12-month, full color piece with a PUP Party on Saturday, Dec. 2. The carnival theme of the event will be held at the Limelight Theatre, 11 Old Mission Ave. in St Augustine with a production of the play, Coney Island Christmas. Guests will enjoy a fun-filled evening with cocktails, hors d’oeuvres, silent auction, a complimentary new calendar, along with the theater performance. Cocktail hour with a silent auction starts at 6:30 pm, and the performance curtain raises at 7:30 pm. Admission is $48 per person. All proceeds will benefit the programs and services of the St. Augustine Humane Society. For more information, call (904) 829-2737 or email mmurphy@staughumane.org. Visit the website at www.PUPparty.org. To view online auction items starting Nov.13, go to www.PUPauction.org. The seventh annual pet photo contest and 2018 calendar fundraiser supports the non-profit’s mission of promoting healthy lifelong pet ownership and reducing the rate of relinquishment to shelters. Local pet winners have been named for “The Cutest Show on Earth” carnival themed calendars which will feature each pet fitted with accessories to match the 12 unique personalities. 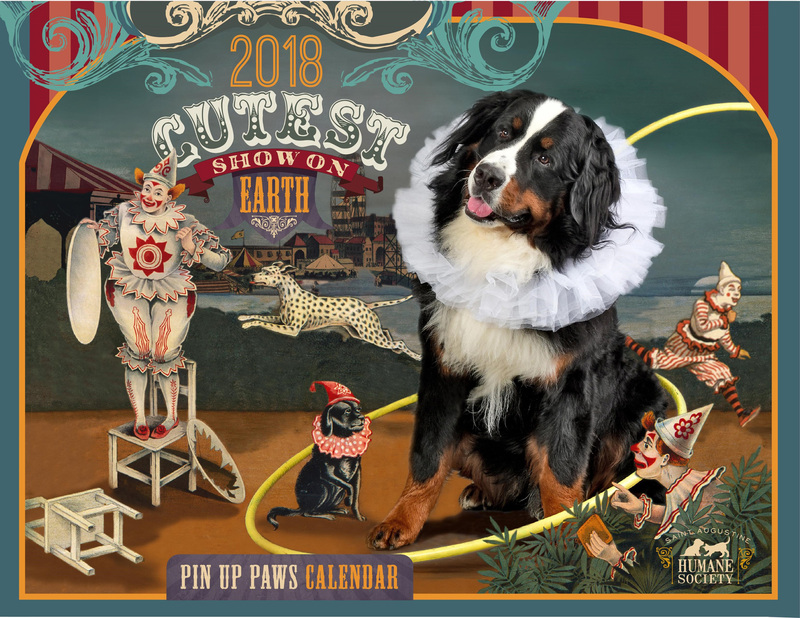 Cash, a beautiful Bernese mountain dog, won first place and has the honor of being named the 2018 Pin Up Paws calendar cover dog. Owner Shelby Cupolo is with Coldwell Banker Premier Properties in St. Augustine and campaigned for 1,830 votes. Cash received a professional photo shoot with photographer Addison Fitzgerald, a $200 Columbia Restaurant gift certificate, two free copies of the 2018 Pin Up Paws calendar, and two free tickets to the PUP Party. Additional top winners included second place Liam Jewel, a rare Albino Pekingese, and the third-place winner is Chelsea, a senior pit bull mix. Additional local winners include nine dogs and one cat that are featured in the calendar. They also received photo shoots, gift certificates and calendars. The calendar contest initially started in June with donors who submitted a photo of their pet to be featured in the 2018 calendar. There was a $5 entry fee per pet to submit the photos, then friends placed votes for the pet in order for owners to win prizes. According to Carolyn Smith, St. Augustine Humane Society’s Executive Director, the fundraiser netted close to $14,000 with voting submissions. Finished calendars cost $10 each and are available at the Humane Society, 1665 Moultrie Road in St. Augustine, and other local retail locations. Visit the website at www.staughumane.org.